Scientists have long known that veins of gold are formed by mineral deposition from hot fluids flowing through cracks deep in Earth’s crust. But a study published today in Nature Geoscience1 has found that the process can occur almost instantaneously — possibly within a few tenths of a second. The process takes place along ‘fault jogs’ — sideways zigzag cracks that connect the main fault lines in rock, says first author Dion Weatherley, a seismologist at the University of Queensland in Brisbane, Australia. For example, a magnitude-4 earthquake at a depth of 11 kilometres would cause the pressure in a suddenly opening fault jog to drop from 290 megapascals (MPa) to 0.2 MPa. (By comparison, air pressure at sea level is 0.1 MPa.) “So you’re looking at a 1,000-fold reduction in pressure,” Weatherley says. When mineral-laden water at around 390 °C is subjected to that kind of pressure drop, Weatherley says, the liquid rapidly vaporizes and the minerals in the now-supersaturated water crystallize almost instantly — a process that engineers call flash vaporization or flash deposition. The effect, he says, “is sufficiently large that quartz and any of its associated minerals and metals will fall out of solution”. Eventually, more fluid percolates out of the surrounding rocks into the gap, restoring the initial pressure. But that doesn’t occur immediately, and so in the interim a single earthquake can produce an instant (albeit tiny) gold vein. “We went all the way to magnitude –2,” Weatherley says — an earthquake so small, he adds, that it involves a slip of only about 130 micrometres along a mere 90 centimetres of the fault zone. “You still get a pressure drop of 50%,” he notes. 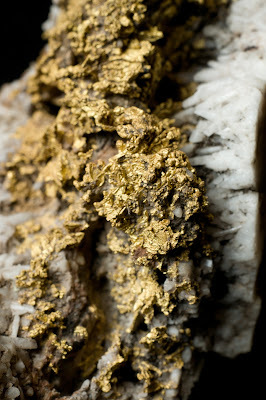 Weatherley says that prospectors might be able to use remote sensing techniques to find new gold deposits in deeply buried rocks in which fault jogs are common. “Fault systems with lots of jogs can be places where gold can be distributed,” he explains. But Taka’aki Taira, a seismologist at the University of California, Berkeley, thinks that the finding might have even more scientific value. That’s because, in addition to showing how quartz deposits might form in fault jogs, the study reveals how fluid pressure in the jogs rebounds to its original level — something that could affect how much the ground moves after the initial earthquake. Note: The above post is reprinted from materials provided by Nature. The original article was written by Richard A. Lovett.